A quick glance at the accompanying chart shows that June is not usually a good month for equities. The chart shows the month returns for June of the FTSE All-Share Index from 1984; one can easily see the market falls more often than it rises in June. And when the market does decline, the falls can be quite large, whereas the positive returns are usually only modest. 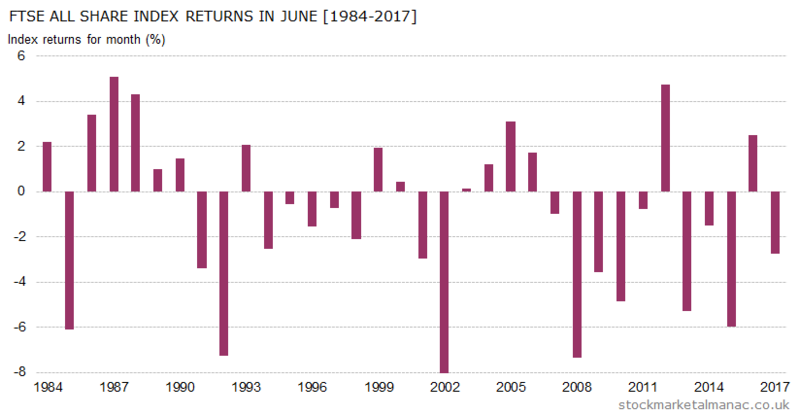 In the 48 years since 1970 the market has seen positive returns in June 21 times, with an average month return of -1.0%. In recent years the record is even worse. 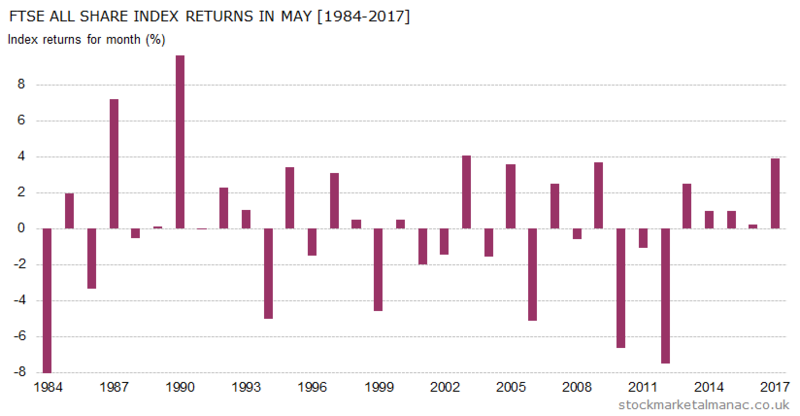 In the 18 years since 2000 the market has seen positive returns in June just seven times (36%), with an average month return of -1.7%. Last year continued the trend, with a -2.8% fall in the market in June. 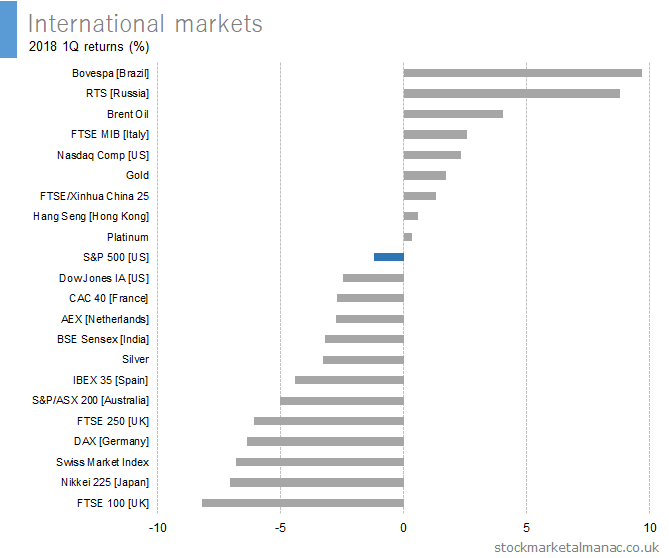 Not surprisingly June has the second worst record for equity returns of all month. And the May-June period has been the weakest two-month period in the year for the market. In an average June the market starts strong, hitting its month high on the second or third trading day, but prices then drift down steadily for the rest of the month, although the market ends the month on a positive note – the last trading day is the second strongest in the year. Over the last ten years FTSE 350 stocks that have tended to be strong in June are: BTG [BTG], RPC Group [RPC], Halma [HLMA], Telecom plus [TEP], and Ted Baker [TED]. While stocks that have a poor track record in the month are: Barclays [BARC], Thomas Cook Group [TCG], Grafton Group [GFTU], Travis Perkins [TPK], and Marston’s [MARS]. 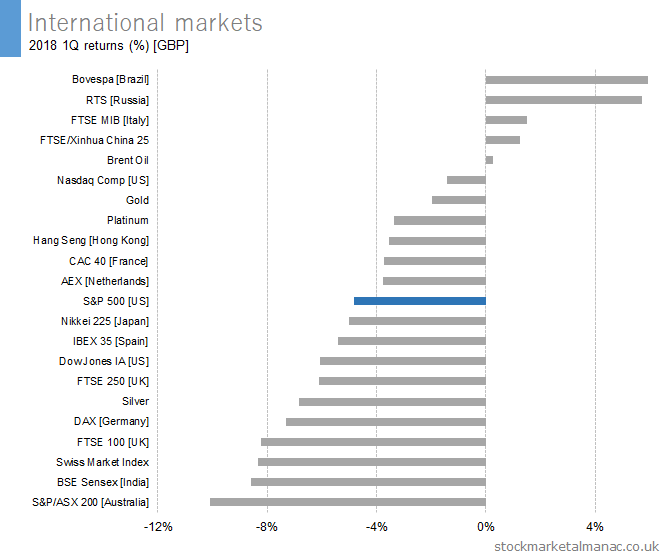 Just two stocks in the FTSE350 have fallen in every June for the past ten years: Barclays [BARC] and Bodycote [BOY]; over this period the average June return for Barclays shares has been -10.5%, the lowest average return for any FTSE350 stock..
Not much action on the results front this month, June is the quietest month for results from FTSE 100 companies – just two companies making announcements this month. This is quite a busy month on the economics front: there is the US Nonfarm payroll report on the 1st, the FOMC interest rate announcement on the 13th, ECB Governing Council Meeting on the 14th, and the MPC interest rate announcement on the 21st. There’s Triple Witching on the 15th. And on the 15th the announcement will be made of any changes in the FTSE 100 and other FTSE indices. It’s that time of the year again when stock market lore advises investors to get out of the market and, effectively, go on holiday for six months. And, indeed, Sell in May has been good advice over certain periods, for example since 1970 the average return in May for the FTSE All-Share Index has been -0.4% (making it one of only three months that has a negative return ­ the other two being June and September). However, in recent years equities have performed somewhat better in May. Since 2000, the market has seen more Mays with positive month returns than negative and, as can be seen in the accompanying chart, in the last five years the market has been up every May (last year, in 2017, the FTSE All-Share Index had a not insignificant month return of 3.9%). So, why does May have a bad reputation for shares, and why is the saying “sell in May” so popular? One reason can be seen in the chart. Although the proportion of positive and negative month returns in May are roughly equal, it can be seen that the positive returns in May are relatively low, whereas when the market falls in May it can suffer quite a large sell-off. In May 2012 the FTSE All-Share Index fell 7.5%, which the largest fall in the index in any month in the last six years. In an average May the market trades fairly flat for the first two weeks of the month, and then prices drift lower in the second half. Coming up in May we have the two-day FOMC meeting starting on the 1st, US Nonfarm payroll report on the 4th, May Day bank holiday on the 7th (LSE closed), MPC interest rate announcement on the 10th, Spring bank holiday on the 28th (LSE and NYSE closed), and the quarterly 30th. Further articles on the market in May. Do you remember the crash of 1999? Chris Robinson, an actor who appeared on “General Hospital”, certainly does. He invested $100,000 hoping to fund his kids’ college education and lost everything. He was left with nothing; well, apart from 20,000 stuffed toys in his garage. 1999 was the year when the barmy Beanie Baby bubble burst*. That was just one more in a long history of economic bubbles. An early bubble was the famous Dutch tulip bulb mania in the 1630s, when an inefficient market allowed the price of tulip bulbs to soar because garden centers hadn’t been invented yet. And if the Brits had been sniggering at the behaviour of those wacky Dutch, they got their comeuppance a hundred or so years later when they piled into the South Sea Company. At the time, many companies jumped on the bandwagon and set up during the South Sea bubble; one such company sold itself as, “carrying on an undertaking of great advantage; but nobody to know what it is.” ­ which must be one of the most cynical, or honest, company mission statements ever. Since then the bubbles have kept coming, and popping. We’ve had bubbles in stocks, bonds, real estate, canals, railways, commodities, derivatives, almost anything that has a price. However, despite bubbles being such a pervasive part of our economic lives there is remarkably little understanding of them. A simple definition of a bubble might be: an asset trading at a price far in excess of its intrinsic value. Sounds reasonable. But intrinsic value isn’t always easy to calculate, especially in today’s world of digital assets. Alternatively, jaundiced traders might define a bubble as merely an increasing asset price that you’re not invested in. The background conditions may include easy credit, loose regulations, and cross border investment, but what causes an actual bubble? There is no general agreement on this. Some hold that they start with an economic or technological event that justifies some increase in asset price, but then emotion takes over. This theory would probably have been supported by Sir Isaac Newton who having invested in the South Sea Company famously said, “I can calculate the movement of the stars, but not the madness of men”. Years later John Maynard Keynes was of a similar mind when he commented, “Markets can remain irrational longer than you can remain solvent”. So, bubbles are the result of irrationality? Not necessarily, say some academics: bubbles may be argued to be perfectly rational, where investors at every point are fully compensated for the possibility that the bubble might collapse by higher returns. Recently, other academics have argued that bubbles are sociologically driven. In theory, central banks can try to curb high levels of speculation through monetary policy actions that might include raising interest rates (sometimes referred to as taking the punch bowl away just as the party is getting good). Fine in theory, but difficult to finesse in practice ­ assuming the will is even there. Even if we can control bubbles, should we? The aftermath of some bubbles can have a very negative effect on the wider economy, for example the fall-out from the credit crunch in 2008. But, some bubbles, while they lose money for investors, leave behind an infrastructure that benefits wider society. For example, canals, railways, and the internet needed excess speculation to raise sufficient funds to build expensive infrastructure, that later generations benefited from. Today, thanks to quantitative easing by central banks, we have what some call the Everything Bubble, which includes stocks, real estate, fine art, corporate credit, auto and student loans. Discount brokerages in the U.S. have reported a surge in trading volumes, with millennial investors particularly active in cryptocurrency and cannabis investments (the latter giving new relevance to the term joint stock companies). So, currently, we’re likely to be more interested in which bubbles will burst first, than looking for new bubbles. But thinking further ahead what bubbles might we see in the future? As The Economist recently pointed out, digital assets with no income streams are very hard to value. So, an obvious place to look for future bubbles will be in the universe of digital assets. For example, if online identities ever become tradable, they could be bubbleable. If the clever people at investment banks manage to securitise access to air and water, then air bubbles and water bubbles would be feasible, and likely. At the beginning of this year California became the latest U.S. state to legalize recreational marijuana. According to Forbes, cannabis-related businesses constitute one of the fastest growing industries in the US, with the medical marijuana market alone expected to grow to $13 billion by 2020. There are still regulatory hurdles to overcome in the U.S., but as these are cleared away expect pot-heads, and prices, to get high and cannabis investments will add a new meaning to the term joint stock companies. The FT recently reported that there are now over three million stock indices, which is 70 times as many quoted stocks in the world ­what might be called a bubble in bubble barometers. In this rush to indexify everything, surely it is only a matter of time before there’s a dedicated Bubble Index, that measures the aggregate bubbliness of global assets. At which point, ETFs, options and futures can appear linked to that index, which could lead to a bubbles in bubbles ­a bubble bubble. Will we be able to predict these bubbles? Yes, says Robert Shiller; no, says Eugene Fama. Shiller and Fama were co-winners of the Nobel prize for economics in 2013; suggesting, again, that economics is less a science and more an art ­ an art drawn in thick crayons by an 8-year old. Some traders would say, don’t bother trying to predict bubbles, just ride the trend. If we did want to try to spot bubbles, we might start by observing that they tend to occur during long periods of low interest rates, leading to increased debt levels and investors chasing income. High asset prices are often justified by the four most dangerous words in investment: it’s different this time. And polite dinner conversations turn to, say, the relative merits of Bitcoin and Ripple. So, these are some warning signs if you want to protect your investment portfolio from bubbles. And avoid any asset called Old Face Teddy. An edited version of the above first appeared in Spectator Money. 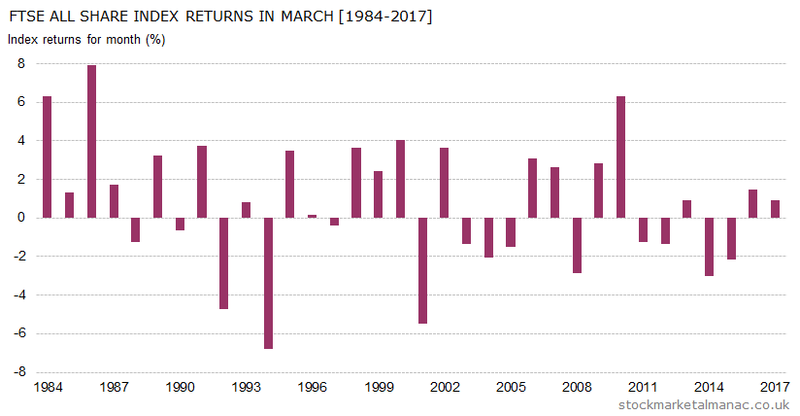 Since 1990 the market has had an average return of 0.2% in March, with returns positive in 54% of all years. This ranks March seventh among months of the year for market performance. 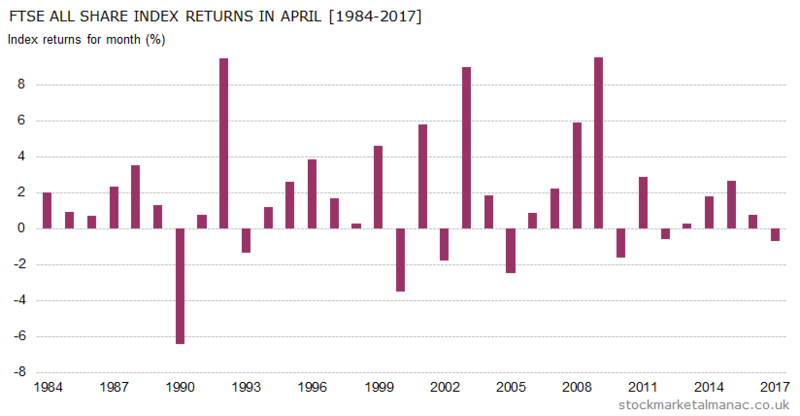 Although as can be seen in the accompanying chart, negative returns have been seen in March with increasing frequency in recent years. 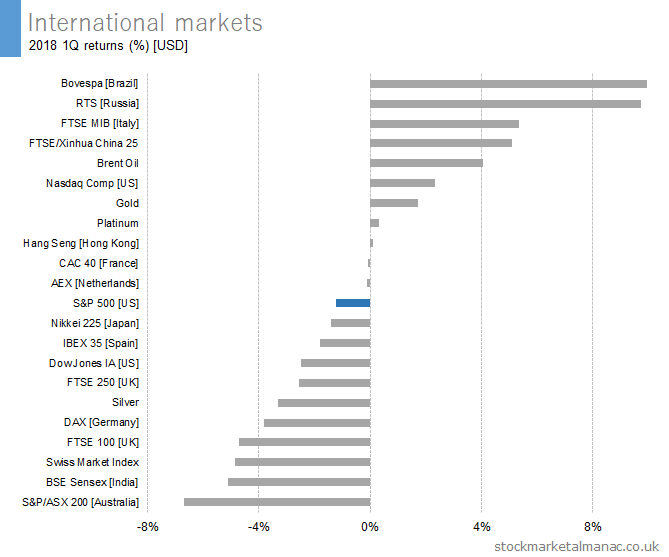 The general trend for the market in March is to rise for the first three weeks and then fall back in the final week – the last week of March has historically been one of the weakest weeks for the market in the whole year. 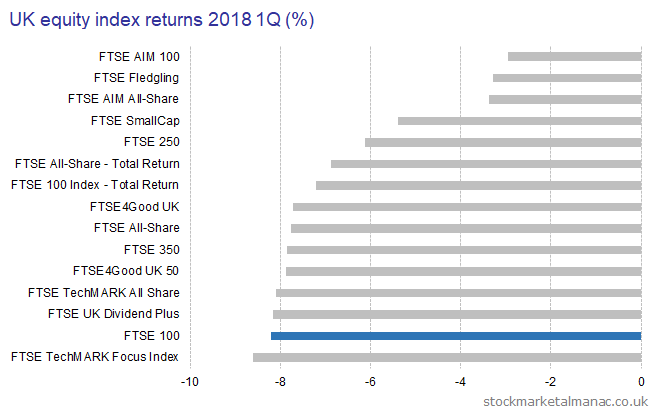 Small cap stocks tend to outperform large cap stocks at the beginning of the year, and March marks the final month of the three-month period when the FTSE 250 strongly out-performs the FTSE 100. Since 1986 in March on average the FTSE 250 has out-performed the FTSE 100 by 0.8 percentage points. 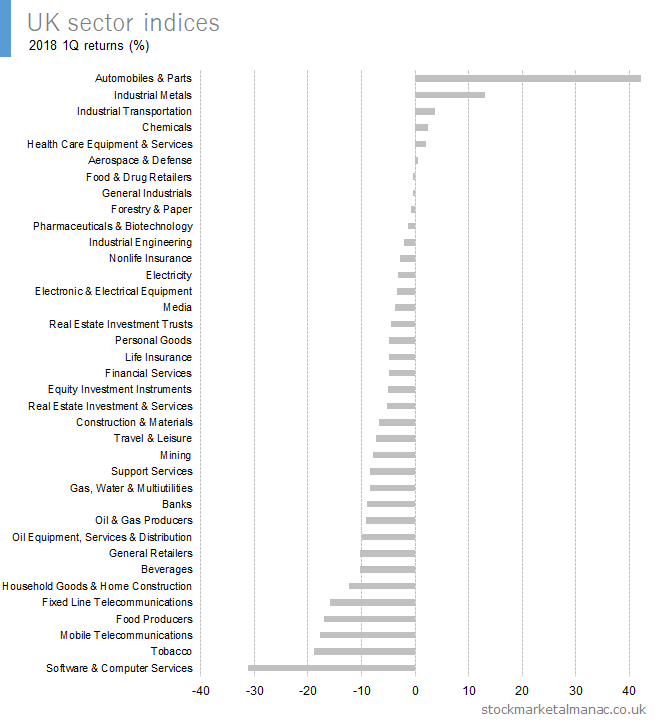 The sectors that tend to be strong in March are: Chemicals, Industrial Engineering, Industrial Transportation, Oil Equipment, Services & Distribution, and Support Services. The Chemicals and Oil Equipment, Services & Distribution sectors have seen positive returns every March for the past 11 years. While the weak sectors in March have been: Banks, Fixed Line Telecommunications, Gas, Water & Multiutilities, Nonlife Insurance, and Pharmaceuticals & Biotechnology. The Banks sector has the worst record: it has seen positive returns in only three of the past 11 years. For stocks, the FTSE 350 shares that have performed the best over the last ten years in March are: IWG [IWG], Clarkson [CKN], Senior [SNR], Intertek Group [ITRK], and Petrofac Ltd [PFC]. Clarkson, Intertek, and Petrofac shares have only been down in March once in the past 11 years. The weakest FTSE 350 shares in March have been Vectura Group [VEC], Lancashire Holdings Ltd [LRE], Kier Group [KIE], Renishaw [RSW], and HSBC Holdings [HSBA]. March is the busiest month of the year for FTSE 100 companies paying dividends. And it’s also a busy month for company announcements: the busiest for FTSE 250 companies in the year with 71 companies announcing their prelims this month (along with 24 FTSE 100 companies). Aside from stocks, March has often been a weak month for gold and a strong month for oil. It’s Good Friday at the end of the month. A famous anomaly in stock markets is that prices tend to be strong on the day preceding and the day following a holiday. This effect is strongest in the year around the Easter holiday. Further articles on the market in March. After market close on 28 February 2018 FTSE Russell confirmed the following changes to the FTSE 100 and FTSE 250 indices. The changes will be implemented at the close Friday, 16 March 2018 and take effect from the start of trading on Monday, 19 March 2018.